The Efco DR51 VB6 wheeled trimmer mower features high-strength construction. is the perfect for clearing medium-sized areas of ground overgrown with weeds, scrub or other invasive vegetation. The reliable 190cc Briggs & Stratton 825 series OHV engine powers this variable speed drive wheeled brush cutter with belt and chain transmission system and recoil start. The machine has a 51cm/20" working width. 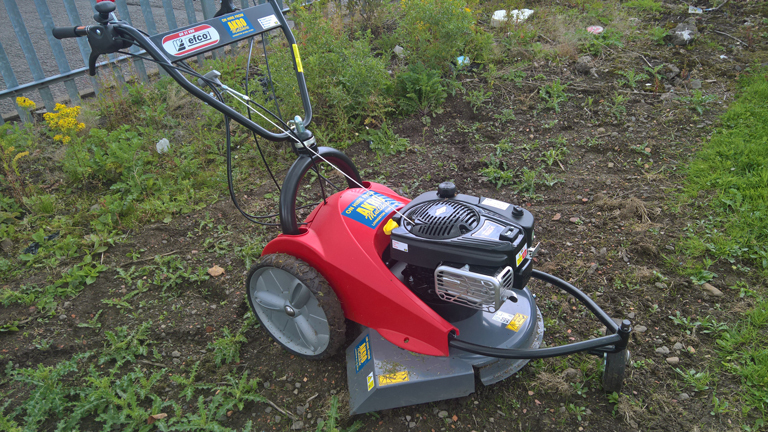 This machine is reinforced mulching blade for impressive cutting action even on dense vegetation, brambles and undergrowth. A reinforced steel deck and tubular steel frame guarantees durability, with a large discharge area for the release of cut materials. The centralised four-position cutting height adjustment is easily controlled directly from a lever on the handlebar for maximum operator convenience.The smooth operation is further enhanced by ball-bearing wheels and rear-wheel differential. The dolly front wheel pivots through 360º to give a tight turning radius and maximum agility.